I am so excited to finally share with you some of the things we have ben up to since we purchased our house back in July. Unfortunately some of my craft projects have been on stand by as there is SO much to do in our house and of course some most things don’t always go to plan. So here is the first part of the hallway makeover! Where do I start with this hallway?! At the moment I have a love/hate relationship with this space. The hallway was not even on the estate agent’s website when we came to view it, so we had a lovely surprise when we first saw it! I instantly fell in love with the space, the high ceiling and the window. I ignored the green carpet, orangey varnish on the banister and the dated wallpaper on the walls (and ceiling!!). I could see past all that! I had a vision in my head and just LOVED the space! When we decided to start decorating the hallway we were in for a big surprise! It wasn’t as simple as we first thought. It took me days, well probably weeks to remove the wallpaper from the walls [and the ceiling!] and scrape the paint off! I spent every night after work and every weekend scraping and sanding the walls. Just look at that dust from sanding!!!! Unfortunately, it was not to be…. Turned out the walls were not even, some of the paint was not coming off and there were a few cracks!! 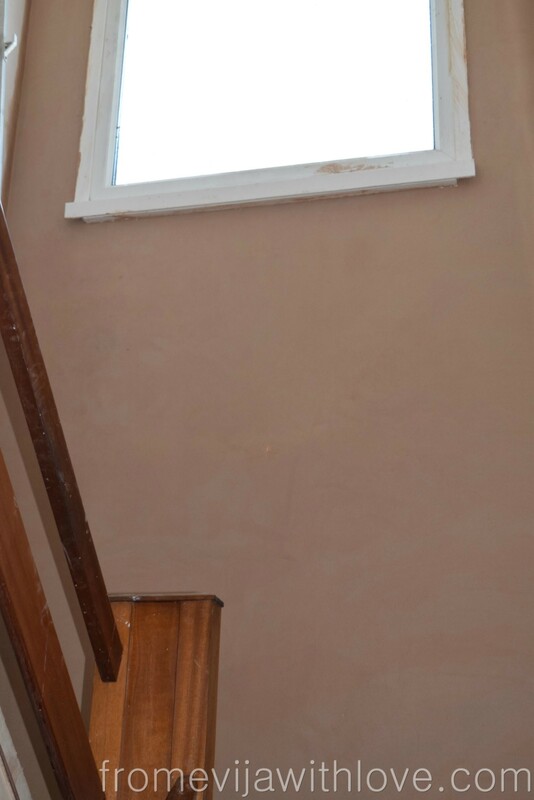 So simple repainting job turned to – calling the plasterer! Thankfully, Neil from NK Plastering in the Isle of Man came to the rescue! Thank you Neil!! One wall turned to 6 and also the ceiling needed to be skimmed too ( I will do a seperate post on the ceiling as of course, there were more issues!) We decided to have it all done properly – this was our dream home, we didn’t want to cut corners! We also decided to close up one of the doors in the hallway. You can read the full post on how we did it here. When I saw the first wall done, I was nearly in tears – it was finally coming together! Next job was to decide the paint colour and install the flooring. In the meantime, you can read how we chose and installed the flooring in my craft room here. Stay tuned for the next part! It is slowly coming together. It’s a tough job when you’re doing it all yourself Evijah, so I’m glad you decided to hire someone to help you! It is indeed Florence! I don’t think we realised how hard this would be! So glad we got someone in to help.. sometimes you just can’t DIY everything!